Another high-scoring Merseyside derby – but this time, the goals were all at one end. Brendan Rodgers was without Glen Johnson, Daniel Agger, Mamadou Sakho, Jose Enrique, Joe Allen and Lucas Leiva, so had a patched-up back four, with Steven Gerrard in the deepest midfield role. Roberto Martinez welcomed back Ross Barkley, but was without both Sylvain Distin and Seamus Coleman. In an extremely intense, fast-paced match, Liverpool effectively sealed the victory by half-time. It’s probably not the midfield format Rodgers would have preferred, but without both Lucas and Allen, Steven Gerrard sat deep in front of the Liverpool defence, as he did recently against Stoke. In the Stoke game, Gerrard sat deep primarily to get space in a match where Liverpool were sure to dominate possession, and start attacks. Here his role was more about defensive duties against a technically accomplished side, and he was genuine defensive midfielder rather than a deep-lying playmaker. This job was a tough task on paper, with Steven Pienaar and Kevin Mirallas moving inside from the flanks to join Ross Barkley, who is excellent at finding space. Gerrard isn’t quite a natural at this role, and he’s reactive more than proactive in the way he interprets it, making last-ditch interception and blocks. In the opening stages he was too frequently dragged into wider zones to stop Kevin Mirallas or Pienaar, which left Barkley free between the lines – notable for the first shot of the game, which Barkley hit marginally over the top from 25 yards. Without (arguably) their best four defenders and their two most disciplined central midfielders, Liverpool had to adapt and defend as a unit. They did this in two separate ways – at the start of the match they pressed high up, putting Everton’s defensive players under pressure and winning possession quickly. In the second half, they sat much deeper, protected their defence while soaking up pressure, and then looked to counter-attack. They’re essentially opposing strategies, but the work rate of the front players was crucial, with Suarez leading the defensive pressure – his harrying of the Everton defenders for the final goal summed up the approach. It was in a 2-2 draw with Everton last season that Liverpool’s counter-attacking threat first became clear under Rodgers. With Suarez and Sterling pushed upfront and Rodgers shifting to a reactive strategy using pace on the break, it pointed the way for this Liverpool side. Rodgers preached possession football in interviews at Swansea and in his early days at Liverpool, but his attacking players are much more dangerous when attacking immediately. That’s been the approach when Liverpol have played their best football this season, and was apparent here. In the first ten minutes, for example, Raheem Sterling hit a huge long diagonal ball for Suarez to chase – fully 70 yards, although John Stones made a good recovery tackle. 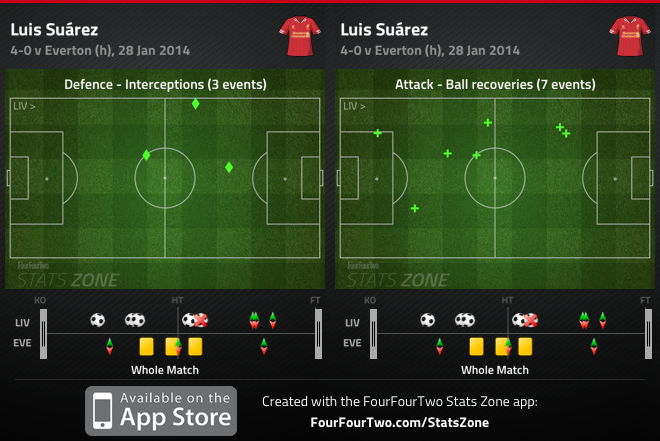 For the third Liverpool goal, Toure hit another long pass over the defence for Sturridge, for a very direct goal. None of Liverpool’s four goals came following intricate passing moves, and while Rodgers would have preferred the option of Allen or Lucas, the absence of these sideways passers meant this was Liverpool’s best counter-attacking midfield and attack. Gareth Barry has been one of Everton’s best performers this season, but endured his worst game of the season. He looked off the pace from the beginning, late to tackles and repeatedly being warned by the referee. He was up against Coutinho, who was simply too quick and tricky for the English midfielder, and was involved in many of Liverpool’s best moves. the Brazilian dribbled inside in the lead-up to a Jordan Henderson volley, then nearly slipped in Henderson with a neat through-ball, then played a pass to Gerrard to strike from distance. This was all within the first 20 minutes, and later he played the assist for Sturridge’s first goal, and the through-ball for Sterling, which won a (missed) penalty in the second half. Coutinho hasn’t been particularly impressive in big games this season, but this was a fine display – especially from a deeper position in a midfield three, where his defensive performance was almost as notable as his creative contributions. Perhaps this might be the key to finding more consistency from him – he enjoys playing centrally but isn’t involved often enough from a classic number ten position. 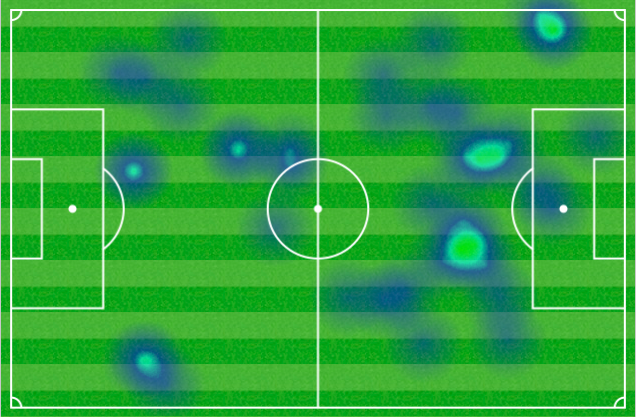 Here, he was in positions to play through-balls, but could receive possession more easily. The most interesting individual clash of the night was down Liverpool’s left. In Coleman’s absence, his replacement Stones might have been expected to play a defensive-minded role, especially with Everton weaker than usual in the centre of defence. Instead, Stones actually played an even more advanced role than Leighton Baines on the opposite flank, who was dealt with nicely by Sterling. This was extremely brave against an opponent as dangerous as Daniel Sturridge, with Luis Suarez sometimes switching with his regular strike partner, too. Maybe Stones wanted to force Sturridge back into a deeper position, but instead he remained high up the pitch – presumably under instructions from Rodgers, considering this was happening right in front of him on the touchline. For both managers, this situation is about managing risk. 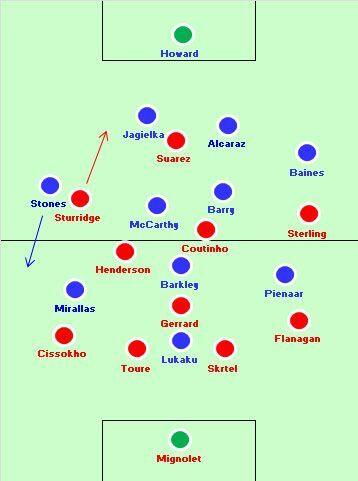 Stones was getting free down the right, repeatedly receiving the ball in advanced positions under little pressure, and helping to overload Aly Cissokho, Liverpool’s weak link. A few promising Everton situations came down that flank, and it seemed the obvious out-ball as the away side tried to get around the Liverpool defence. But the danger, of course, was that Sturridge was free – and with the centre-backs being pulled around by Suarez upfront, they weren’t in a great position to help if he received the ball on the break. And that’s exactly what happened for Liverpool’s third goal, with Everton conceding cheaply in the centre of midfield, Stones significantly in advance of the ball, and Sturridge all alone to receive a simple but accurate Coutinho through-ball to finish. Another point of interest was two mistakes by Tim Howard when sweeping – he didn’t need to come out for Sturridge’s first goal, and invited a simple lob. Later, his dart off his line was so ill-judged that you could practically see the moment Sterling decided to play for a penalty. Howard has made a few mistakes in this respect under Martinez – notably when he conceded a penalty and was dismissed against Sunderland, in a 1-0 defeat. This is almost certainly a consequence of Everton playing with a higher defensive line and dominating possession more – he remains a good shot-stopper, but must improve his decision-making when sweeping. It’s difficult to pinpoint a single reason that won Liverpool this game, but there were a variety of impressive factors: their speed on the counter-attack, Coutinho’s measured use of the ball, Sturridge’s positional bravery and Gerrard’s performance in his deeper position all contributed. The opening goal was vital, too – a simple header from a set-piece – because that allowed them to play reactively, drawing Everton up the pitch before breaking into space, which is when Rodgers’ Liverpool are at their best. Michael, do you really think that Sakho is better than Toure? Sakho is so inconsistent in my opinion, I wouldn’t put him in Liverpool’s best four defenders. Sakho is good in the air; Toure generally isn’t. Sakho is stronger and faster as well. It’s true that Sakho sometimes errs in judgment which is due to his youth and shows why Toure’s experience adds something to the club. Still, I would rank Sakho higher. Liverpool is well equipped with a variety of backs with different strengths and weaknesses. Unfortunately, their use is being dictated by unavailability due to injury rather than tactics designed to address opponent strengths and weaknesses. Sturridge was phenomenal… Everton had no answers for him. I always felt that Chelsea gave up on Sturridge too easily. Happy to see him playing well after a change in scenery. I know Roberto Martinez loves to play with a high defensive line, but I don’t think this was the right decision in this match. When you’re going up against forwards like Sturridge and Suarez, you cannot afford to make mistakes – they will punish you. there more to this game than you had written . one most notable things that BR asked of his liverpool players when they defended that they close mccarthy down very quickly . now if anyone who had noticed that mccarthy is in the team because of his athletic ability for his work rate rather than being a creator or a true defensive midfielder . he has helped everton press proactively which is why they had been able to play a high line . now while on offense he hadnt been tested in other he had found time on the ball . he is not even technically very good knocking the ball in first go . what that meant was barry had to play long passes to barkley ,mirallas and lukaku while he was on the field . now these are ground passes so even if you find space to receive the pass the ball takes a second to come to your feet and by that time the opposite player can come and close you down . now generally everton likes to play through the centre with pinnear and mirallas both coming which in turn leaves baines and when coleman is there space open wide .in this game liverpool a bit deep if you see liverpool just crowded that central area . henderson and coutiniho didnt come too high to press barry who was free to make a pass . they made sure that evrton found little space in the middle . evertons game was hampered because of lukaku’s injury since they couldnt find a pivot in the centre of the pitch around which they can play or who can finish the ball in the middle . another facet of everton’s bad defense was the space between barry and mccarthy and how much were they further apart . just look at the space between gerrard and henderson . they were not 10 yrds apart while there was too much of space between barry and mccarthy . now last but not the least against a team like liverpool and a player like suarez and coutiniho in the side do you play a high line where your centre backs are flat footed . they can thread that high line as per they wish . now how do you particularly play against suarez . he lingers on the CB,s shoulders . he runs channels . he come deep and lets other go past him which had been the feature about liverpool this season .most importantly are your CB’s good enough to chase him around and stop him . alcarz is bit athletic but jagielka is good old fashioned english centre back who doesnot likes to come out of his zone .that is where suarez triumphed he played against jagielka rather than alcarz and most importantly if one of the pieces on the board gets mobile he can get everybody mobile . last liverpool played on the counter and direct which is what they can play . Nice analysis Michael. One note, you’ve mixed up Sturridge’s goals in the paragraphs around the Stones / Sturridge graphic. The first was the through ball, the second the lob. @Dushant – I was shocked at how high the line was, especially after some warning signs in the beginning of the game, with Suarez sent free on the left once, and the pass to Sterling that he should have scored on. If you check out the Daily Mails’ heat maps, Sturridge doesn’t actually seem to have been playing much wider than Suarez. Is this purely down to the Daily Mails’ heat maps only considering touches rather than where the players actually spent most of their time? Does anyone provide heat maps that do that? Pity Sturridge capped off his performance by being his usual bratty self. Likely one of the reasons hes failed with so many managers. It’s things like this that can de-rail our CL push. Hopefully he apologized and alls well again. If suarez is lfcs messi, then sturridge is the Sanchez and he needs to accept his place. The match emphasised one key difference between Everton and, for instance, Man City – the shallowness of the squad. One solution to manpower problems is Chelsea’s: if you don’t have any worthy centre-forwards, you don’t particularly miss one if he’s injured. Subtle, eh? I’m surprised there’s no mention of how Everton failed to adjust after Lukaku went off. Would it have been better to push Mirallas up to centre forward, and bring on Osman to play on the right, rather try to replace Lukaku with Naismith? A great article on the game again Michael Cox… there aren’t too many commenters on the site these days, but don’t stop! This is my go-to site for reading up on matches. Kudos to you Mr Cox also on the variety of games you cover. Everton pressed too high, particularly with their full backs. Stones had a good game and looks a good player but many will think he isn’t, due to his caught out of position here, but surely that was Martinez telling him to bomb forward. Baines didn’t have a productive game, which didnt help Everton, and they seemed to miss Distin. Perhaps if Everton had used another defender – something like Martinez’s 3-4-3/ 5-2-3 he used at Wigan – the full backs would have had to stay more defensive and one could see at least 2 of the goals being avoided from that. Then they could have played through Barkley more – as far as I could see, the match was pretty even in midfield and while Everton found some joy in wide areas, their main chances came from playing through Barkley and Osman. That said, Mirallas was a handful (from wide) as is to be expected of a player of his skill. That’s disrespectful and also very naive, imho. Allen is excellent at finding angles and breaking up lines. Lucas on the other hand is a quick-thinking player, who is also very well capable of playing vertical passes. His calming presence in front of the back four shouldn’t be underestimated. Don’t think he means to denigrate them, just a comment on the sort of passes that they most frequently play (again, nothing wrong with that). If you had to make the same sort of statement about Steven Gerrard, you’d say that he tended to play raking ambitious passes. That doesn’t mean he does it all the time, just more often than not.